The Breezy Hill line is total of 7.1 miles of water main (4,310’ 24”, 18,370’ 20”, and 14,680’ 16”). Project included multiple MS4 approvals, DOT approvals, South Carolina Department of Health and Environmental Control (DHEC) permitting, construction inspection, flushing, testing and disinfection. 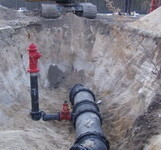 PRVs were also used to provide water to lower pressure zones. 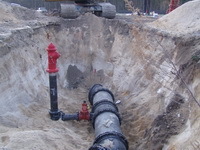 Water main was completed in 2012.